If wind power really is cheap and getting cheaper all the time, why is it that every State or Nation ‘powered’ by the weather is suffering power prices magnitudes higher than those that continue merrily chugging away on coal, gas or nuclear power? 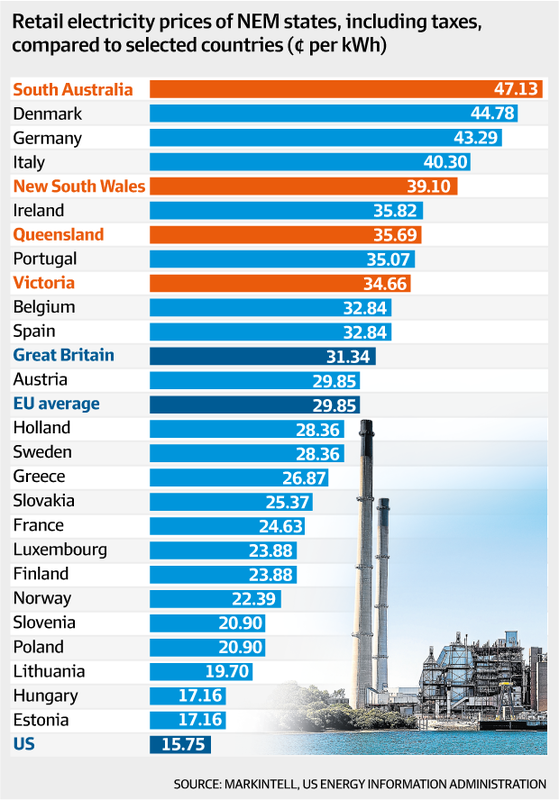 South Australia, Denmark and Germany suffer the highest power prices in the world (in that order); funnily enough, all of them have built enormous wind power generation capacity, subsidised by power consumers and/or taxpayers to the tune of hundreds of billions of dollars: see above the comparative rates in cents (Australian) per KWh, as at 1 July 2017. Call us ‘suspicious’, but STT is pretty sure it has something to do with attempting to run on a system that was made redundant in the 18th century, as soon as British engineers mastered the art of turning steam into motive power. Wind power was redundant then; it still is. 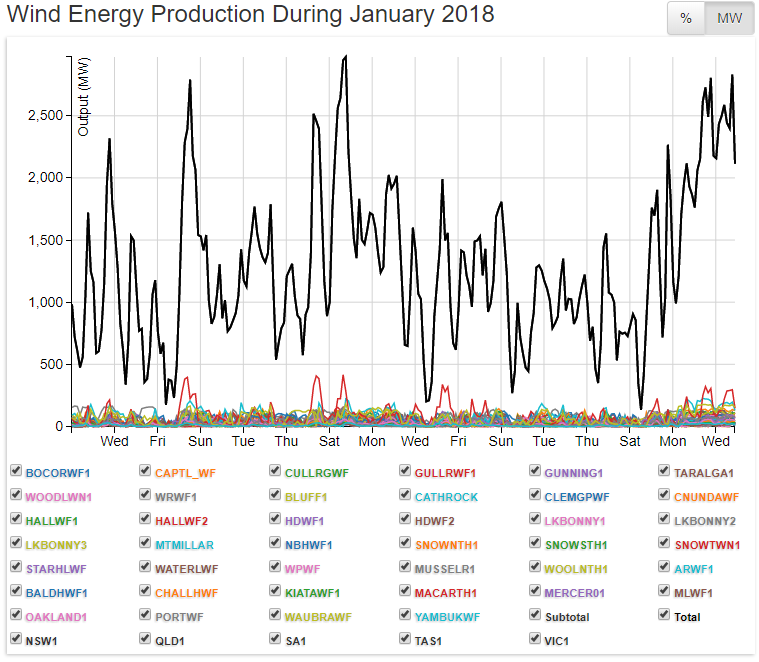 Behind every MW of wind power capacity, somewhere in the system, there is a MW of coal, gas, nuclear or hydro to cover the fact that wind power is wholly dependent on the weather. Wind power is not, and will never be, a meaningful power generation source. Consider a country where its electricity supply was exclusively based on wind power generation; a place where businesses would attempt to run around the vagaries of the weather; where houses would be well-stocked with candles and their occupants left to keep food cold with kero-fridges or iceboxes – and those homes otherwise run on wood, sticks or dung, used for cooking or heating. Sounds like fun, doesn’t it? As soon as that country had the chance (due to the availability of technology and/or as a process of economic development) it would build a system based on power generation sources available “on-demand” (ie coal, gas, nuclear, or, geography and geology permitting, hydro or even geo-thermal). Placed in the practical context of the needs of a functioning society, wind power can be seen as the patent nonsense that it clearly is. If a country didn’t have a conventional power system (as Australians and Americans do), it would build one, anyway. For those countries adding wind power capacity to a coal, gas or nuclear powered grid, in reality, they’re simply duplicating the cost of their original system (which works) with one that will never work (see above). Those wholly unnecessary costs are borne by households and businesses. Once people grasp that fact, the rest of the wind industry’s ‘case’ falls away. Talk about “wind farms being in the right place” just sounds silly; ergo, with arguments about distances from homes; separation from bird nesting sites or migration routes etc, etc. All of these other considerations – while legitimate – simply jump to the periphery and dilute the strength of the key argument. With examples like South Australia, politicians who have yet to grasp the insane cost and pointlessness of wind power as a generation source are either deluded and/or in on the rort. One of those is New York’s Governor, Andrew Cuomo. His wind power obsession is dressed up as ‘green virtue’. In reality it’s all about crony capitalism, as laid out by Robert Bryce below. Since 2015, Gov. Cuomo has been hyping his scheme to remake the state’s electric grid so that by 2030 half of the state’s electricity will come from renewable sources. But Cuomo’s ambition — to prove his renewable-energy bona fides and thus position himself as a viable Democratic candidate for the White House in two years — is colliding headlong with reality. Indeed, two events Monday, one in Albany and the other in the upstate town of Somerset, showed just how difficult and expensive his plan has become and how New York ratepayers will be stuck with the bill. In Albany, the New York State Energy Research and Development Authority released its “offshore-wind master plan.” The agency said it was “charting a course to 2,400 megawatts” of offshore capacity to be installed by 2030. That much capacity (roughly twice as much as now exists in all of Denmark) will require installing hundreds of platforms over more than 300 square miles of ocean in some of the most navigated, and heavily fished, waters on the Eastern Seaboard. It will also be enormously expensive. According to the latest data from the Energy Information Administration, by 2022 producing a megawatt hour of electricity from offshore wind will cost a whopping $145.90. Offshore wind promoters claim costs are declining. Maybe so. But according to the New York Independent System Operator, the average cost of wholesale electricity in the state last year was $36.56. Thus, Cuomo’s presidential ambitions will require New York consumers to pay roughly four times as much for offshore electricity as they currently pay for juice from conventional generators. Why is the governor pushing so hard for offshore wind? The answer’s simple: The rural backlash against Big Wind is growing daily. Just a few hours after NYSERDA released its plan, the Somerset town board unanimously banned industrial wind turbines. The town (population: 2,700) is actively opposing the proposed 200-megawatt Lighthouse Wind project, which, if built, would be one of the largest onshore-wind facilities in the Northeast. Numerous other small communities are fighting the encroachment of Big Wind. In the Thousand Islands region, towns like Cape Vincent and Clayton have been fending off wind projects for years. Last May, the town of Clayton approved an amendment to its zoning ordinance that bans all commercial wind projects. Last September, the Fort Drum Regional Liaison Organization announced its opposition to eight proposed onshore-wind projects due to the deleterious effect those projects could have on radar systems and military aviation. The move by the Watertown-based group, which is dedicated to assuring Fort Drum’s future, will likely derail more than 1,000 megawatts of proposed wind-generation capacity. The onshore backlash has left Cuomo with no choice but to move his renewable-energy obsession offshore. Last year, in his State of the State Address, Cuomo touted the fact that all of the proposed wind turbines will be so far offshore that “Not even Superman standing on Montauk Point” will be able to see them. The Man of Steel may not be able to see them, but plenty of fishermen will, and they are none too happy at the prospect of having hundreds of offshore platforms obstruct their fishing. To protect their interests, fishermen and fishmongers from New York, New Jersey, Rhode Island and Massachusetts have filed a federal lawsuit to block an offshore wind lease won by Norwegian oil company Statoil ASA, at the site of one of the best squid and scallop fisheries on the Eastern Seaboard. That lawsuit is still pending. In short, Cuomo’s push for offshore wind shows how desperate he is to show his pals at the Natural Resources Defense Council and the Sierra Club how much he loves renewable energy. Never mind that New York’s electricity prices are already 40 percent higher than the US average or that his offshore scheme will send those rates even higher. 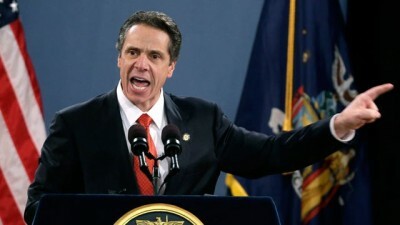 Cuomo determined to deliver wind power chaos to New Yorkers. That debacle in New York State is what AEMO’s Audrey Zibelman left behind her …her gift as their energy Czar….along with ‘undisclosed vested interest’ allegations ..when she was hired by the Turnbull government to run her ‘great experiment’ here….the reckless ‘audacious grab for power’ described by Danny Price of Frontier Economics…..
…that had desperate Australian manufacturing representatives last night on Q&A begging to know [from a smug and insolent insouciantly smirking Frydenberg]…if there’s any reason…ANY ASSURANCES of affordable reliable electricity on the way …any help that might prevent what they see as their ONLY RECOURSE…to shut up shop …sack their workers …and leave the country forthwith. When worried New York state residents expressed doubt this time last year ..about the security of the energy system Zibelman designed for them…just weeks before she arrived here…..she reportedly told them they could always run a lead to Canada. In July, 2017, Gail Tverberg produced an outstanding piece on the true cost of wind and solar (Our Finite World is her website). Ms. Tverberg was a long time contributor to The Oil Drum and is no fan of fossil fuels. However, in her customary expansive fashion, she describes both the theoretical and real-world situations which convey the outlandish costs of these projects. The more historical events that show how crazy, how expensive this stuff is to the wider population, the more apt to ‘head it off’/’shut it down’ might become the norm … hopefully. According to the Canadian Fraser Institute report, “Rising Electricity Costs and Declining Employment in Ontario’s Manufacturing Sector” October 17, 2017 (https://www.fraserinstitute.org/search/site/Rising%20Electricity%20%20Costs%20and%20Declining%20Employment%20in%20ontario%27s%20Manufacturing%20Sector), under the “Green Button Program” (Green Energy and Green Economy Act of 2009) electricity prices rose by 50%, resulting in an 18% decline in manufacturing output and a 28% drop in employment; Ontario’s manufacturing sector accounts for almost 40% of Canada’s exports. In Post-Industrial Germany (Internet of Things (IOT)- money from data: Neither can be eaten or provide anything to the physical economy that supports people), Kalkar, former experimental fast-breeder nuclear reactor site, is now an amusement park. There at least, you can sit on the grass under a tree, unlike at wind turbine sites and solar arrays. The lunatics are in charge of the asylum; (Soylent?) Green population reduction. Medieval technology for serfdom intention: “Returning Australia to Serfdom” has been on the Liberal Party agenda for more than 25 years and was presented at a Canberra conference as stated to me by a Party Member.